I am so excited to introduce you to a fabulous new toy for girls. Pinypon is a colorful collection of interchangable dolls and accessories. I was thrilled when I was picked to host a MommyParties sponsored by Pinypon. 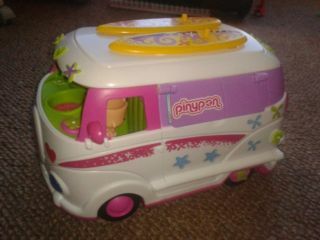 When the party pack arrived my children couldn't get enough of the Pinypon toys. Even my son was excited when he saw they had sent a boy Pinypon doll. 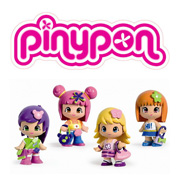 For all of you who haven't heard of Pinypon just picture a mini-dolls world filled with dolls who love fashion, accessories and the newest hairstyles. Shopping is one of their favorite things to doand they love traveling too. Along with their pets, they travel the world in their caravan. Pinypon is a colorful collection of interchangeable friends. You can mix and match everything - dresses, accessories, hairstyles, bodies, and even faces. All the kids at the party had a great time switching and trading accessories and hairstyles! The caravan was super cute. It opens up to a little house. Inside there is a kitchen and a little bath which you can actually use water with. The caravan also came with a ton of accessories that you can use when you play with it. Disclosure: I received a free party pack from MommyParties and Pinypon in exchange for my honest opinions.